This frozen ice pop maker helps you to create homemade ice pops. Use juice, puree, apple sauce, ice cream and more! Each pop container holds three ounces. Making these frozen pops is a great project to do with the children or grandchildren! 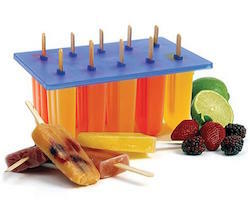 Includes plastic cover and 24 popsicle sticks for making 10 (3 oz.) ice pops.